Very rare vintage horror movie poster of one of the scariest films ever made, The Omen (1976) for sale. Featured here for sale is an actual surviving original poster of the first film in the Omen series, i.e. The Omen (1976). 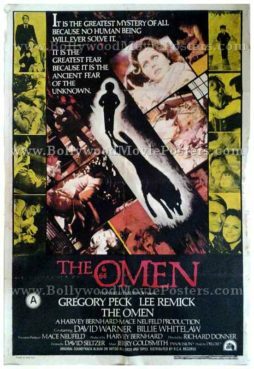 Scripted by David Seltzer, The Omen was a massive commercial success and won numerous awards, making this old horror movie poster highly collectible. This vintage horror movie poster for sale bears the original logo of the film, with the numbers “666” written inside the film’s title (inside the letter “O”). Printed and circulated in India somewhere in the late 1970s during the film’s release in India, this poster was originally intended for publicity but never ended up being used.